Phoenix is the capital and most populous city of the U.S. Kick off your visit on the 21st (Thu): take in the awesome beauty at Camelback Mountain. Here are some ideas for day two: get interesting insight from Tours, then examine the collection at Buddy Stubbs Harley-Davidson, and then admire the natural beauty at Desert Botanical Garden. To see reviews, other places to visit, maps, and more tourist information, go to the Phoenix tour itinerary planner. New York City to Phoenix is an approximately 8.5-hour combination of bus and flight. You can also fly; or drive. You'll gain 2 hours traveling from New York City to Phoenix due to the time zone difference. Prepare for much hotter weather when traveling from New York City in March: high temperatures in Phoenix hover around 82°F and lows are around 57°F. Finish your sightseeing early on the 23rd (Sat) so you can drive to Grand Canyon National Park. 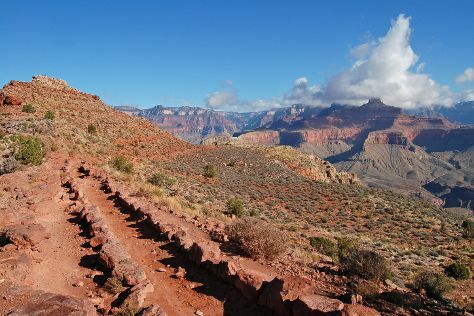 Escape the urban bustle at Rim Trail and Grand Canyon South Rim. On the 25th (Mon), hike the day away at Bright Angel Trail. Next up on the itinerary: trek along South Kaibab Trail, take some stellar pictures from Mather Point, and explore the stunning scenery at Inner Canyon. For reviews, maps, photos, and other tourist information, you can read our Grand Canyon National Park travel itinerary planner. You can drive from Phoenix to Grand Canyon National Park in 4 hours. Traveling from Phoenix in March, expect Grand Canyon National Park to be cooler, temps between 57°F and 23°F. Finish your sightseeing early on the 26th (Tue) so you can drive to Petrified Forest National Park. Petrified Forest National Park presents a surreal landscape of large deposits of petrified wood. Start off your visit on the 27th (Wed): hike along Blue Mesa, then make a trip to Painted Desert Inn, and then admire nature's extreme beauty at Painted Desert. To find traveler tips, ratings, photos, and more tourist information, go to the Petrified Forest National Park road trip app . You can drive from Grand Canyon National Park to Petrified Forest National Park in 4 hours. In March, plan for daily highs up to 59°F, and evening lows to 25°F. Wrap up your sightseeing on the 27th (Wed) early enough to travel to Raleigh. For those not from the South, Raleigh might be one of the region's better-kept travel secrets. On the 28th (Thu), get a new perspective on nature at North Carolina Museum of Natural Sciences, then explore the world behind art at North Carolina Museum of Art, then tour the pleasant surroundings at Pullen Park, and finally get curious at Marbles Kids Museum. To see ratings, where to stay, other places to visit, and other tourist information, use the Raleigh trip itinerary maker . Traveling by combination of car and flight from Petrified Forest National Park to Raleigh takes 10.5 hours. Alternatively, you can drive; or do a combination of taxi and bus. The time zone changes from Mountain Standard Time (MST) to Eastern Standard Time (EST), which is usually a 2 hour difference. Expect a bit warmer evenings in Raleigh when traveling from Petrified Forest National Park in March, with lows around 38°F. Wrap up your sightseeing on the 28th (Thu) early enough to travel back home.